Galerie Simon, Paris (no. 8944). Anonymous sale, Christie's, London, 25 June 1990, lot 41. D. Cooper, Juan Gris, Catalogue raisonné de l'oeuvre peint, vol. II, Paris, 1977, no. 516 (illustrated p. 339). Bern, Kunsthalle, Braque, Gris, Picasso, April 1948, no. 96. 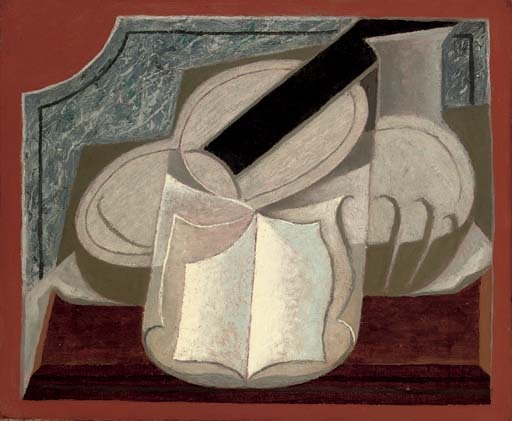 Painted in 1925, during a period in the last few years of Gris' life which Daniel Henry Kahnweiler considered the most fruitful and beautiful of the artist's career, Le livre et la guitare is a lyrical and beautifully constructed still-life. An array of overlapping forms, contained elements and fictive borders, edges and frames, Le livre et la guitare recalls Gris' earlier cubist aesthetic but has been softened into a more rounded and harmonious composition. 'From the purely technical point of view it was certainly the most rigorous period of his life. Stately and firm, his paintings had become the "flat coloured architecture" of which he talked. Everything was restored to the flat surface... Gris revealed himself at this time as a classical painter: lucidity, purity, the preponderance of the work of art itself, the predominance of the general, the static quality, all the symptoms are there. He is classical too in the way he subordinates his emotion to the work in which it is expressed' (D.H. Kahnweiler, Juan Gris, His Life and Work, London, 1969, pp. 129-130).